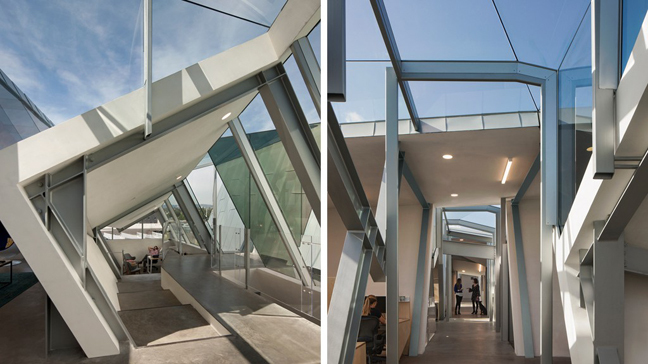 The Pterodactyl is an office building for an advertising agency atop a parking garage in a complex of new and remodeled buildings in Culver City, Los Angeles. The perceived relationship of the two uses from the primary west elevation emphasizes the office building presence and minimizes the visibility of the parking garage. The parking structure is the conceptual podium for the office building. Buildings in the area are three floors or less, so the office building on the roof affords spectacular views of the entire city from downtown to the Santa Monica Mountains to the Westside of Los Angeles and the Pacific Ocean. The 800 car, four level parking structure is straightforward and inexpensive construction – steel frame, metal decks, regular bays, and ingress/egress ramps at opposite ends of the west face of the project. The required fireproofing of the structural steel was treated as a finish material and precisely applied to the steel frame. 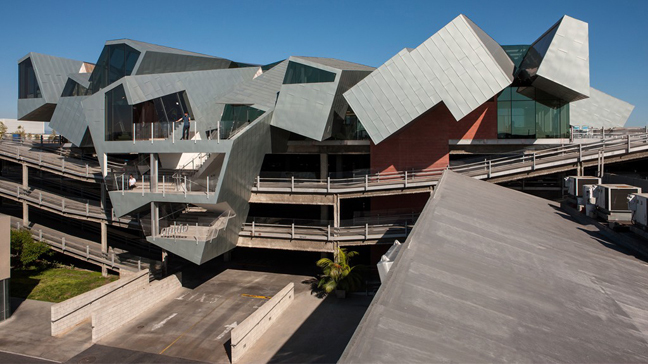 The Pterodactyl is the final phase of the Wedgewood Holly campus: office buildings that were originally part of a grouping of contiguous warehouses in Culver City that had been added to incrementally since the 1940s. The design premise required a strategic removal of portions of the original buildings in order to establish discrete new building identities, allow sufficient space for landscaping, and accommodate both pedestrian and automobile circulation on the site. 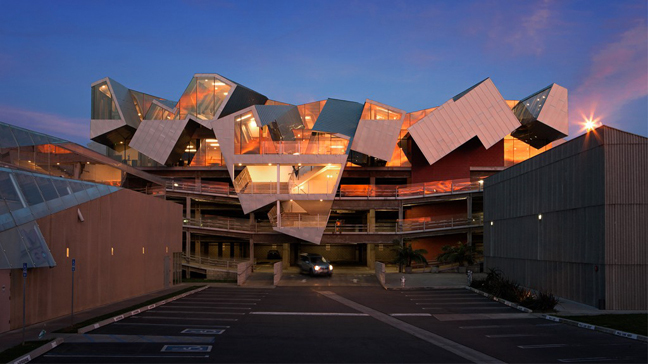 The complex consists of five buildings, all designed by EOMA: Stealth, Umbrella, Slash, Backslash and now, Pterodactyl. The office building is formed by the intersection of nine rectangular boxes, lifted one level above the garage roof, stacked either on top of, or adjacent to each other, along the west edge of the garage roof. The nine boxes organize essential program elements connected by an interior, second floor bridge. The underside of the boxes is cut to accommodate an open plan on the main office floor below. The boxes are supported on the steel column grid extended from the parking structure. 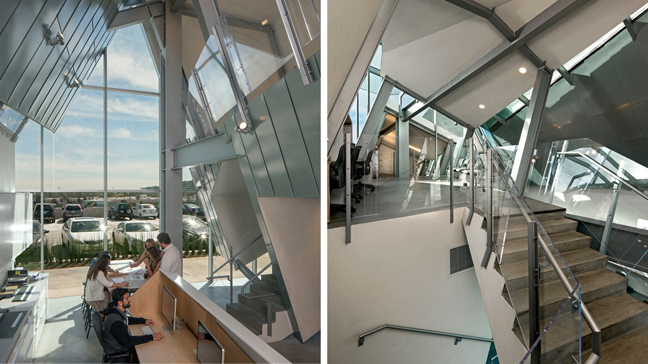 The main office floor is rectangular in plan and enclosed with a glass wall that extends vertically to meet the elevated boxes one level above. The main floor is an entirely open plan, while the second floor is subdivided between open working areas and enclosed conference rooms and private offices, as the program requires. The Pterodactyl utilized Digital Project/Catia to provide advanced building information modeling (BIM), account for every detail of the building, and design complex structural and mechanical systems with a high level of control and precision. The model provided a direct interface with engineers and fabricators, increasing the accuracy and level of detail of construction drawings. Consultants collaborate directly in the model, providing a powerful tool for project management, cost estimating, and scheduling. The original four-level parking garage was built in 1998. 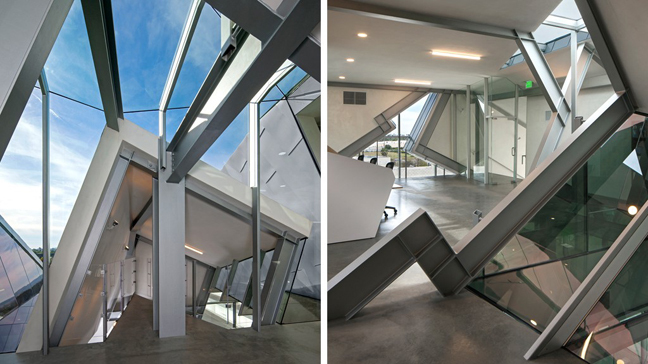 The structure was designed to anticipate a future building, with steel columns extended above the top floor plate. With the addition of the Pterodactyl in 2015, the final element of the Wedgewood Holly complex is complete.